On Friday, the U.S. Bureau of Labor Statistics will release the employment report for the month of February. After January’s report showed the economy adding jobs and pulling workers off the sidelines, the major question this month is whether this trend will continue. If it does, it will be another indication that worries about the United States pushing up against full employment are premature. 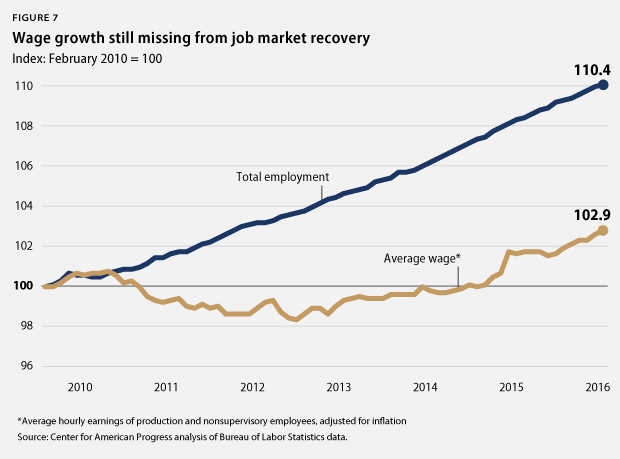 The labor market is economically healthier today than at any other point since the Great Recession, but at this point in its expansion, it is unclear how much more the economy can grow. The national unemployment rate for the month of January fell to 4.9 percent, a record low in this recovery and half its peak of 10 percent in October 2009. And in the past year alone, the labor market has seen robust job growth at an average rate of about 222,000 new jobs per month. Yet January’s increases in labor force participation show that there is considerable room for growth in the labor market. 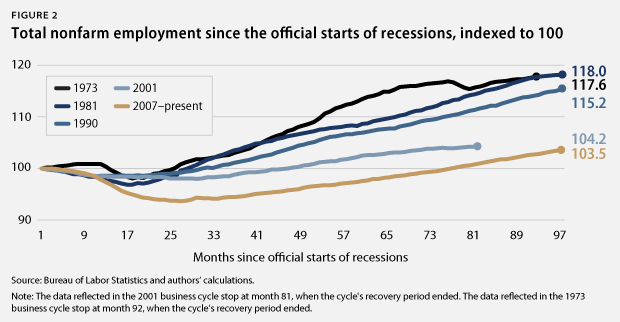 This recovery has set records, yet the depth of the recession means that the labor market recovery is far from complete by historical standards. If this year’s stock market gyrations have relieved the pressure on the Federal Reserve to slow down the economy, the labor market is showing it’s capable of much more growth, even if there is more uncertainty in the air this month than we have seen over the past year. There were 12.3 million more jobs in January 2016 than in June 2009, when the recession officially ended. During this same time period, the private sector added 12.8 million jobs. 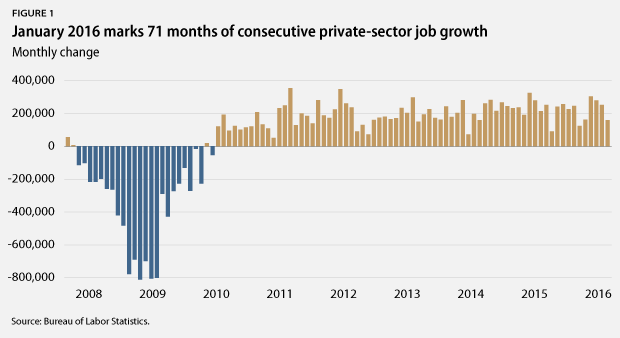 In January alone, the private sector added 158,000 jobs to the economy, marking 71 months of consecutive private sector job growth. Overall, job growth has been particularly robust over the past year, with average growth of about 222,000 jobs per month. However, job growth in this recovery has not been especially robust relative to previous economic expansions. During the economic expansion of the 1990s, for example, the economy added at least 250,000 jobs per month 49 times. During the current expansion, which has now lasted more than half as long, we have seen only 20 months of job growth at or greater than 250,000, which includes abnormal hiring involved with conducting the decennial census. Meanwhile, at the average rate of recent job growth, The Hamilton Project estimates that we may not reach our former level of employment, when factoring in new labor force entrants, until as late as mid-2017. * Combined with the extraordinary job losses that the U.S. economy sustained during the recession, the pace of both job and wage growth suggests that there is much more slack in the labor market than the headline unemployment rate may indicate. 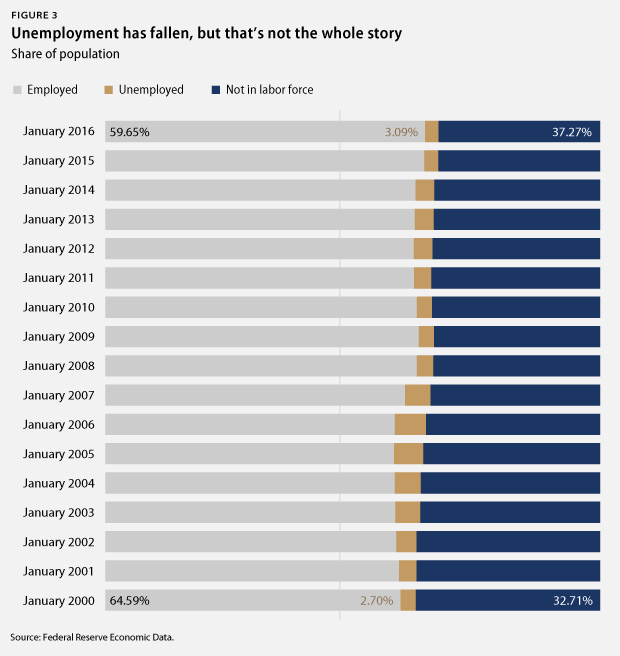 January marked the 17th consecutive month that the headline unemployment rate—otherwise known as U-3—was less than 6 percent, as it dropped to 4.9 percent from December’s 5 percent rate. This is a record low since the end of the Great Recession in June 2009. While this does mark significant progress in the recovery, it is important to remember that there are broader measures of unemployment that paint a clearer picture of the employment situation. 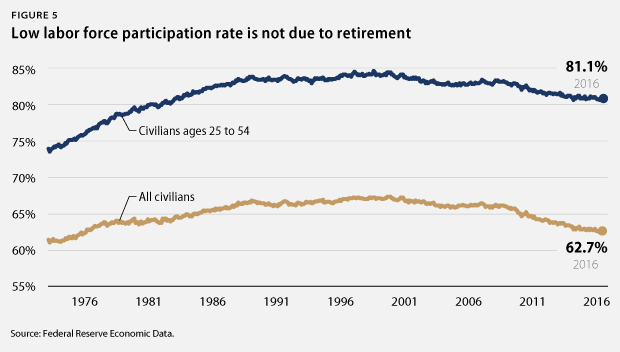 Another important measure is the labor force participation rate. When the economy is doing well, more people typically enter the labor market because there are more jobs available. So one should expect the labor force participation rate to be increasing in the aftermath of the recession. However, it hasn’t been. Rather, it has declined steadily since the recession’s end and is as low today as it was in the late 1970s, when women entering the workforce became the norm. Even with three solid months of gains, labor force participation is still low by historical standards, which suggests that there is considerable room for job gains going forward. 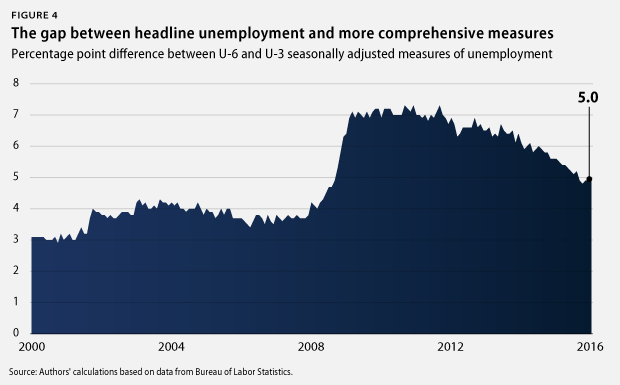 In January 2016, long-term unemployment was near a record low since the end of the recession, hitting less than one-third of its postrecession peak. Today, while down sharply, the number of long-term unemployed people is still almost as high as its highest prerecession level in 2003. There are still more than 2 million Americans who have been unemployed for more than half a year and are still actively searching for work. 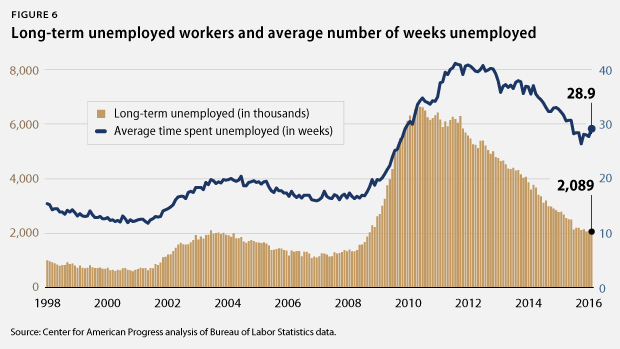 26.9 percent of all unemployed workers fall into this long-term unemployed category. The average length of time someone has spent unemployed is about seven months, well above what it was right before the recession. 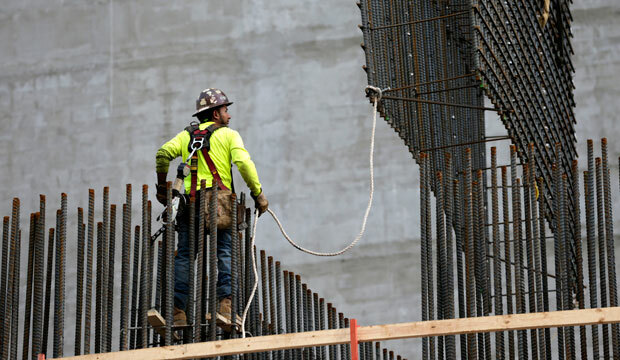 This is the real challenge that the Federal Reserve faces: It’s hard to predict what wage and price growth will do as the economy picks up steam, but so far, workers seem to be slowly coming off the sidelines, raising employment but tempering wage growth. However, this cannot happen forever. Unfortunately, the Fed has already shown it will raise interest rates to fight nonexistent inflation. Given this recent move, markets are understandably concerned about what the Fed will do in 2016. Historically, the Fed tends to increase rates gradually, suggesting that December’s rate increase is a sign of things to come. Economic fundamentals, though, suggest that policymakers should wait to increase rates for some time. * Note: Authors’ calculations are based on data from the Bureau of Labor Statistics and The Hamilton Project’s Jobs Gap tool. See The Hamilton Project, “Closing the Jobs Gap,” available at http://www.hamiltonproject.org/jobs_gap/ (last accessed February 2016). The methodology for the authors’ estimates of labor force dynamics is detailed in the following source: The Hamilton Project, “Understanding the ‘Jobs Gap’ and What it Says About America’s Evolving Workforce” (2012), available at http://www.hamiltonproject.org/papers/understanding_the_jobs_gap_and_what_it_says_about_americas_evolving_wo/. An explanation of an updated analysis can be found here: The Hamilton Project, “An Update to The Hamilton Project’s Jobs Gap Analysis” (2014), available at http://www.hamiltonproject.org/papers/an_update_to_the_hamilton_projects_jobs_gap_analysis/. Michael Madowitz is an Economist at the Center for American Progress. Shiv Rawal is a Research Assistant for Housing Policy at the Center. Juliana Vigorito is a Special Assistant for the Economic Policy team at the Center.